– create your ultimate custom feed by combining many feeds into one, then sorting, filtering and translating them. – geocode your favorite feeds and browse the items on an interactive map. – remix your favorite data sources and use the Pipe to power a new application. – build custom vertical search pages that are impossible with ordinary search engines. – power widgets/badges on your web site. 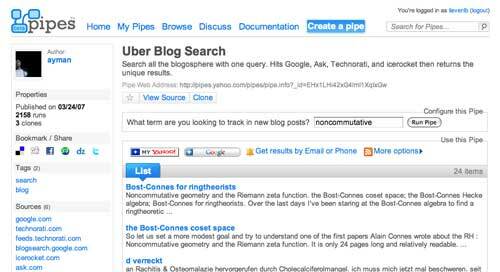 – consume the output of any Pipe in RSS, JSON, KML, and other formats. I’ve posted before on setting up your own lifestream, or your own planet, or scraping feeds, or subscribing to my brain, or … whatever. The good news is : all these ideas are now superseded by Pipes! Pipes is a free online service that lets you remix popular feed types and create data mashups using a visual editor. You can use Pipes to run your own web projects, or publish and share your own web services without ever having to write a line of code. You make a Pipe by dragging pre-configured modules onto a canvas and wiring them together in the Pipes Editor. Once you’ve built a Pipe, you’ll be able save it on our server and then call it like you would any other feed. 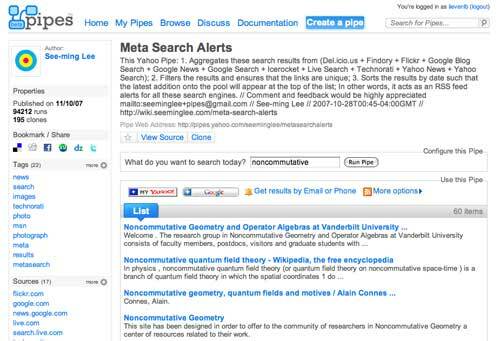 Pipes offers output in RSS 2.0, RSS 1.0 (RDF), JSON and Atom formats for maximum flexibility. You can also choose to publish your Pipe and share it with the world, allowing other users to clone it, add their own improvements, or use it as a subcomponent in their own creations. Pipes has an iTouch-friendly interface (see above left). All you have to do is to Safari to iphone.pipes.yahoo.com and use them. Here are a few public-pipes you can use out of the box! iPhone / iPod Touch: The Most Comprehensive Feed Ever!, doing what it promises : giving you the best iTouch-posts without having to roam for them. JSON Geocoder, returning lat/lon/address info from the the given address. lifefeed – virable, Easily Aggregate your social whereabouts great for blogs profiles and more! Aggregates Your Feeds From: -Digg -Last.fm -Twitter -Flickr -Del.icio.us and your very own blog Adopt and Improve, enjoy!